DTCP Approved Prestigious Gated Community (L.P No: 02/2018/VSP) of Sri Aditya Township, an extent of 10 acres offers housing plots for sale for affordable price at Adduru of Chodavaram Mandal, Visakhapatnam. Enter plot number (for example: a6) and get complete details of your selected plot. 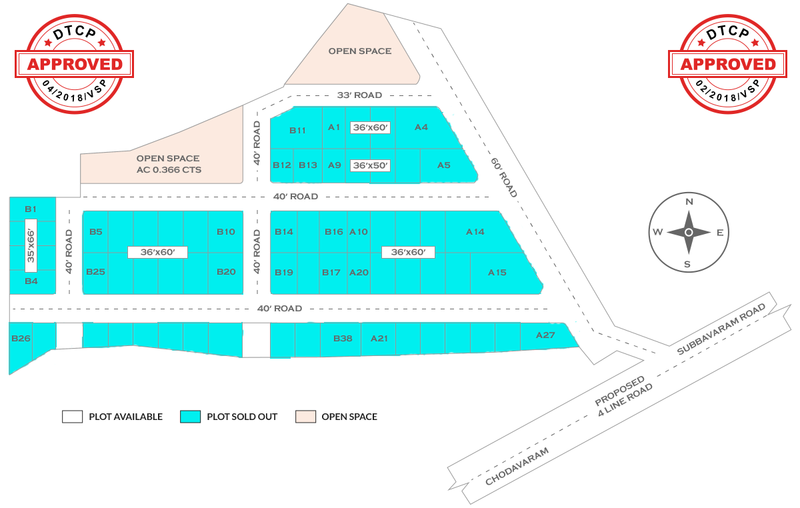 Sri Aditya Township’s President Estates is a right place to invest your hard earned money. Sri Aditya Township is one of the top real estate companies in Visakhapatnam and successfully completed 6 projects in various locations of Visakhapatnam and now we are introducing President Estates and contact us immediately for booking your plot.